Google hasn't just made a great Android phone, it's made a whole new Pixel. After spending nearly a week with the Pixel 3 XL, my three first impressions of Google’s newest handset haven’t changed: It’s the fastest Android phone I’ve ever used. The cameras are awesome. The notch is an eyesore. Thankfully, the first two qualities make up for the third. Mostly. If the Pixel 3 XL didn’t have such an ostentatious notch, it would still be an ugly phone, but after a couple days I wouldn’t have cared anymore. Six days later, the notch is still the first thing my eyes go to every time I unlock my phone. It would be one thing if there was some next-generation camera or sensor that demanded such a large notch. But as it stands, there appears to be a lot of unnecessary space around the twin cameras, ambient light sensor, and speaker that live inside it. You’ll find two front cameras and a speaker in the notch. It sure looks like these components have excessive breathing room. But I don’t want to waste too many words debating the merits of the Pixel 3 XL’s notch. Google has already signaled that it will be adding a way to black it out via software—which may or may not improve things—and it basically comes down to preference. If you can deal with it, get the Pixel 3 XL. If not, get the notchless Pixel 3. It’s that simple. Because otherwise, the Pixel 3 is more than just another great Android phone. It’s the emergence of the Pixel as a bona fide smartphone platform. 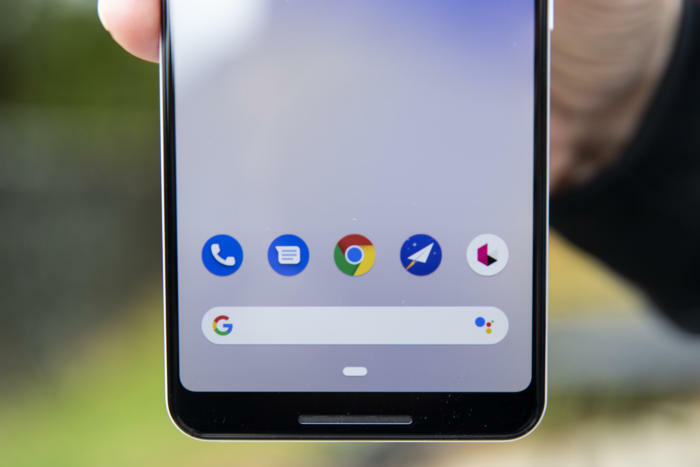 There are features of other phones that may be better—the Galaxy S9’s design, the Huawei P20’s camera hardware, the Note 9’s battery—but no single Android phone can top the end-to-end performance that the Google delivers with the Pixel 3. The back of the Pixel has always looked better than the front, but that stark juxtaposition is amplified to an absurd level on the Pixel 3. The all-glass back of Google’s new phone is one of the nicest I’ve ever used, even in Google’s relatively pedestrian assortment of colors. The green poewr button is the Pixel 3’s most distinctive design feature—other than the notch. The new Pixel doesn’t need the reception-friendly glass window anymore, but the Pixel 3 retains the trademark two-tone look of its predecessors. The corners of the square are now curved to match the phone’s shape, giving the design a natural flow it didn’t have before. To mimic the aluminum look and feel of the first two Pixels, the bottom of the Pixel 3 XL is made of frosted glass, and it’s difficult to describe how luxurious it feels. Back when it created the iPhone 7’s “jet black” color, Apple developed a new manufacturing process that gave the aluminum a glass-like feel. Google’s frosted glass has the opposite effect: It makes the Pixel’s glass back feel like smooth aluminum. The result is a texture that’s less slippery and fingerprint-prone than most other glass phones. I’ve picked up a couple of scratches during my first case-less week with it, but they aren’t nearly as noticeable as they are on other all-glass phones. 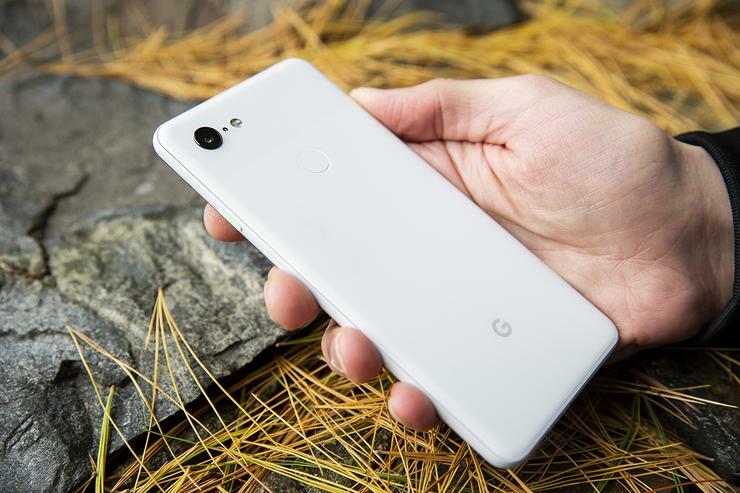 The sides of the Pixel 3 are aluminum to match the back color, with the non-black models once again featuring a colored power button to break up the monotony. And of course, there’s no headphone jack, though Google is finally bundling a pair of Google Assistant and Translate-capable USB-C Pixel Buds in the box. 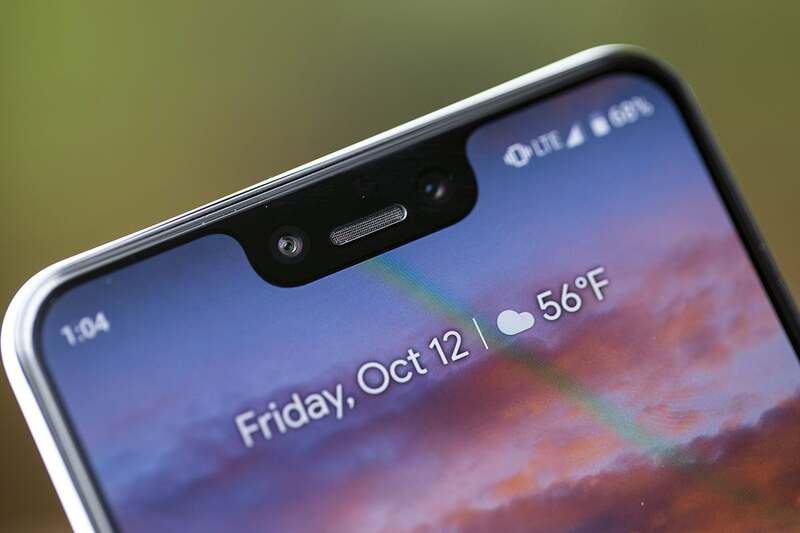 Would you like some chin to go with your notch? Flip the phone over, however, and the refinement ends. Other than the deservedly maligned notch, it has relatively thick bezels around the top and sides, along with a chin that’s about as big as last year’s 2 XL. Another annoyance: The corners at the bottom of the screen don’t match the shape of the ones at the top of the screen, making the phone appear even more unbalanced than it should. Even when you find an app that’s optimized for the tall notch, it just doesn’t look quite right. What does look right is the display itself. 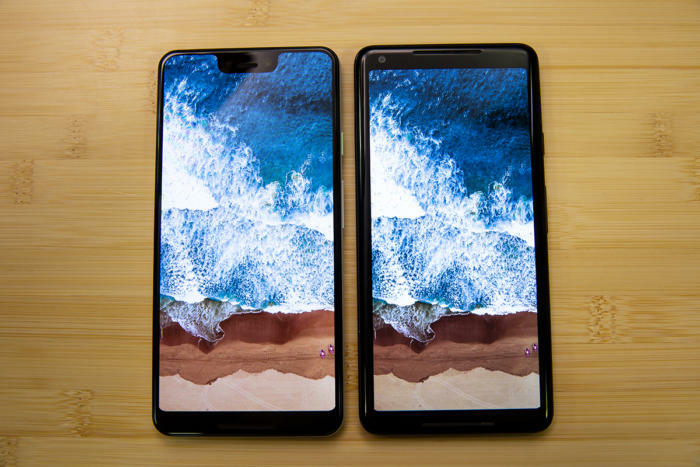 While the Pixel 3 XL has basically the same Quad HD 1440 P-OLED screen as the Pixel 2 XL (albeit with a slightly lower 523 ppi), the displays couldn’t be more different. Where my Pixel 2 XL’s screen is dull and lifeless, the Pixel 3 XL’s display is as sharp, bright, and vibrant as any OLED I’ve used, with none of the annoying blue shift that plagued its predecessor. I didn't even need to adjust the color settings from "Natural" like I didn't with the 2 XL. The display on the Pixel 3 XL (left) is dramatically brighter, crispler, and more vibrant than the Pixel 2 XL. It also feels better to the touch. There was a cheapness to the Pixel 2 XL’s oleophobic coating (the thing that’s supposed to prevent it from collecting unsightly fingerprints) that wore down over time and made the screen appear even more muted. But the glass on the Pixel 3 XL feels much better to my fingers. And the speed and crispness of animations make it feel like it has a 120Hz refresh rate (it doesn't). The Pixel 3 XL’s 6.3-inch screen fits well in your hand. We already saw the results of LG’s new display process in the V40, and it’s even more evident here. The clarity of the display on the Pixel 2 XL was its biggest weakness, but on the 3 XL Google has turned the display into an strength, notch and all. On paper, the Pixel 3 XL isn’t all that impressive. It’s got a Snapdragon 845 processor with 4GB of RAM, 64GB or 128GB of storage, and a 3,430mAh battery. Nearly every one of its competitors offers at least 6GB of RAM, more internal storage along with an SD card slot, and greater battery capacity. But the new Pixel does more with less. Performance-wise, the Pixel 3 XL is insanely fast. And it needs to be, since Android 9’s new gesture navigation isn’t just on by default—it’s the only way to use the Pixel 3. I’ve been using it on the Pixel 2 XL for awhile, but on the Pixel 3, “Swipe up on Home button” feels more natural then ever. Animations fly, app switching is buttery smooth, and the new haptic feedback engine gives the whole system a subtle tactility that makes it much easier to grasp. 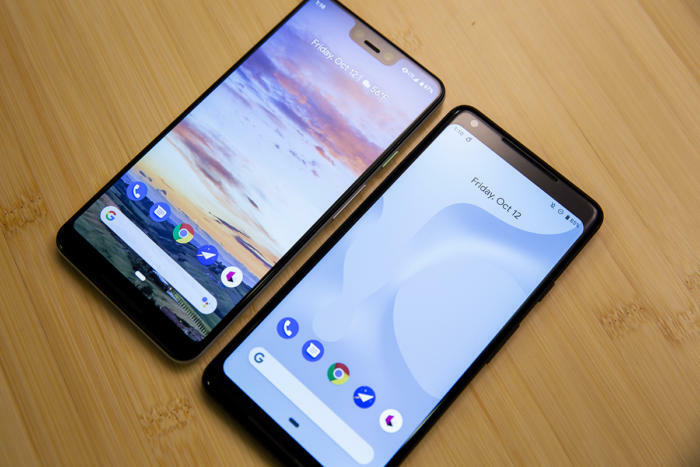 With the Pixel 3 XL (left), Google has added more than a quarter-inch of screen in the same body as the Pixel 2 XL. But it’s not just navigation that’s faster. The Pixel 3 is so speedy and smooth, it feels like a new variation of the Snapdragon 845 chip, like the 821 in the original Pixel. The Pixel 3 XL makes newer phones like the LG V40 and Note 9 seem laggy by comparison and last year’s handsets (including the Pixel 2 XL) basically obsolete. The battery isn’t quite as impressive as the speed gains, but it’s still very good. The capacity is a touch smaller than the Pixel 2 XL’s 3,520mAh battery with even more pixels to push, so you’re not going to see any major real-world gains. It’s about as good as the Pixel 2 XL, which is to say it’s good enough for most days, but heavy workloads will require a power boost before day’s up. It’s not quite in the league of the all-day-and-then-some Note 9 or the iPhone XS, but Google promises that the Pixel’s adaptive battery will learn your habits and shut down battery-killing apps and processes. It’s something I’ll keep an eye on for sure, but during my first few days with the Pixel 3 XL, I got about 6 hours of screen-on time, which is acceptable for a $900 phone but certainly not mind-blowing. 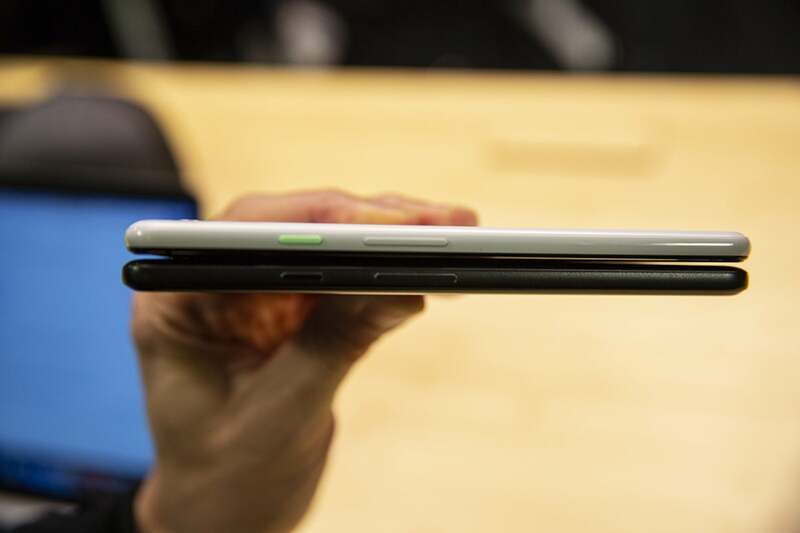 The Pixel 3 XL (top) is the exact same thickness as the Pixel 2 XL but it’s been improved in every way. Basically, the new Pixel feels like the Android equivelant of a new iPhone, with a super-speedy UI, acceptable battery, and bare-minimum RAM. The Pixel 3 may run Android 9, but the platform is pure Google. The back-end optimization and customizations at play on the Pixel 3 breathe new life into Android, in a way that partners such as Samsung or Huawei just can’t duplicate. It’s almost like Google is making a statement with the Pixel 3: Specs alone don’t make the phone. With the Pixel 3, Google isn’t merely showcasing the best Android has to offer. It’s building an AI-driven platform that no other smartphone can match. There’s the bloat-free app drawer and promise of regular updates, of course, but even beyond that, the third-gen Pixel elevates Google Assistant to a system-level feature like Do Not Disturb or the new Digital Wellbeing. The Pixel 3’s Call Screen feature lets Assistant be your.. well... assistant. We got a good look of Google’s AI-centric vision with Lens and Active Edge on the Pixel 2, but the Pixel 3 elevates Assistant in real and practical ways. It’s most visible in the Phone app. The somewhat controversial, somewhat inconceivable Duplex chat bot will be able to make restaurant reservations on your behalf. That’s sure to create some buzz for the Pixel once it starts rolling out next month. When you receive a call on your Pixel 3, a new “Call Screen” button lets Google Assistant answer the phone for you. You’ll be able to see a real-time translation of what the person on the other end says, and you can either pick up the call or continue the conversation using Assistant. It’s remarkable in both its abilities and accuracy, and I’m actually looking forward to the first time a telemarketer calls. But what’s truly astonishing is that this technology exists in a smartphone. It’s the kind of feature that separates the Pixel from the rest of the field. And while these features are launching on the Pixel 3, they won’t remain exclusive to the newest handsets. 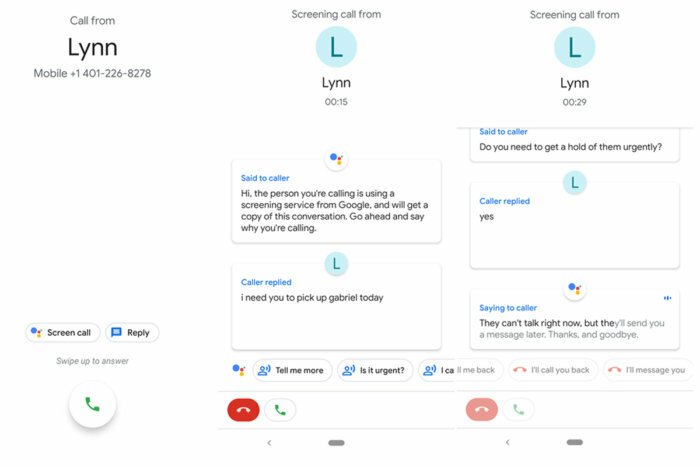 The entire Pixel platform—that is to say, all three generations of the phone—will be gaining Call Screen, Duplex and a few other new AI features. These aren’t mere weather reports and alarms. We’re looking at real-world AI applications that will actually enrich our lives, and not just cut down on how often we need to tap the screen. Since the first Pixel arrived, Google has delivered spectacular results from a relatively tame camera array thanks to its stellar AI and post-processing prowess. 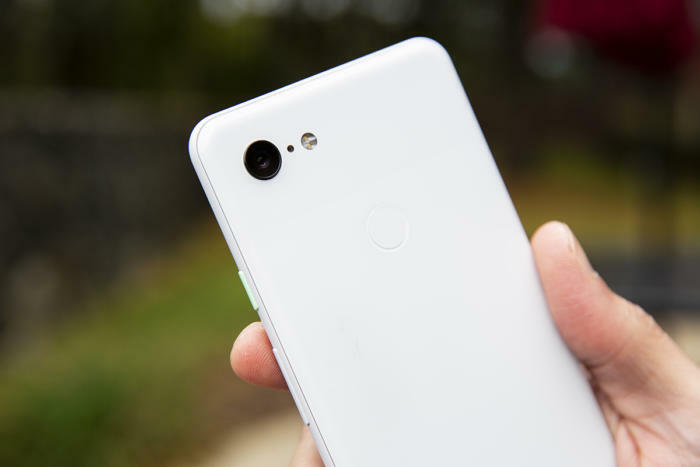 And as expected, the main camera on the Pixel 3 hasn’t changed at all (12.2 MP, f/1.8, 1.4µm, OIS), though Google says the sensor has been upgraded. The camera app still doesn’t have manual control, but it offers a few new tricks. But even without a second lens or DSLR-style manual controls, Google has given the Pixel 3’s photo-taking abilities quite an upgrade. 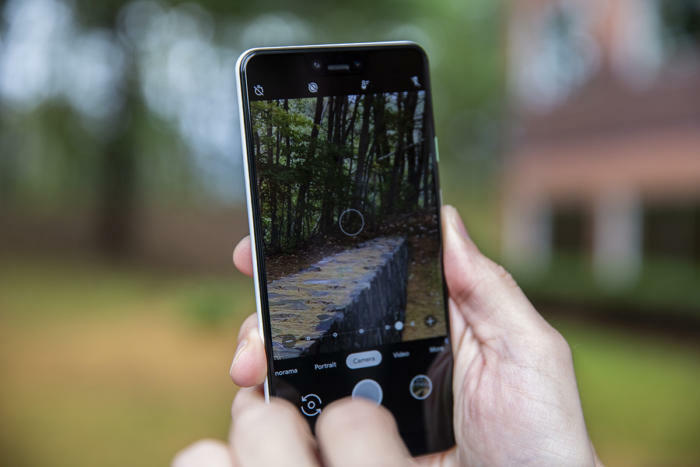 There are several new modes and enhancements that make capturing the perfect photo both fun and easy, thanks in large part to a new Pixel Visual Core image processing chip. Chief among them is a feature called Top Shot that takes the gimmicky Live Photos and makes it useful. When the AI engine detects something moved in the frame just as you were snapping the shutter, it’ll offer up a series of image options captured before and after the shutter squeeze. This lets you you grab a pic before someone blinked or after something blew into your shot. It’s a little tricky to find—you need to swipe up on the pic in Photos to see the multiple images available—but it’s a fantastic feature. Portraits from the Pixel 3 XL (left) are noticeably improved over the Pixel 2 XL (center), but only a true dual-camera phone such as the Galaxy Note 9 (right) is able to consistently nail down the edge details. 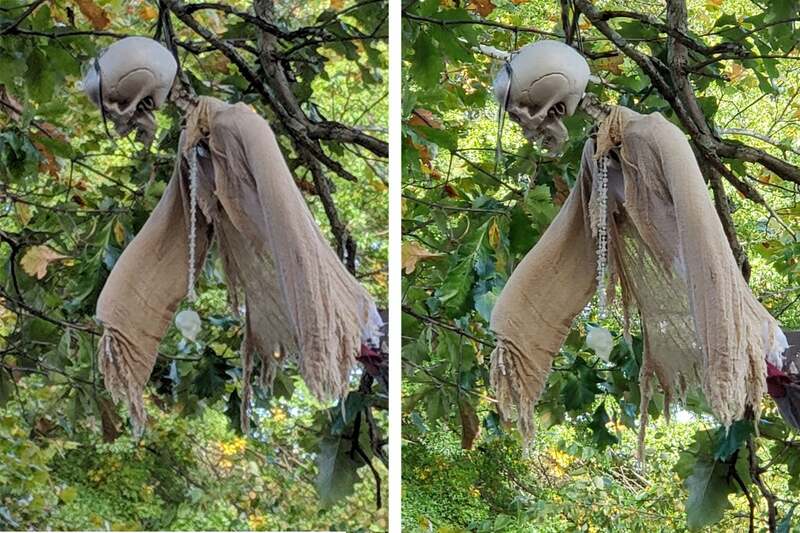 Without a second lens, Google’s photo AI does all the heavy lifting on the Pixel 3, handling portrait mode again, as well as two new features, Super Res Zoom and Night Sight. These AI tricks compensate for the Pixel’s underwhelming hardware, and they mostly get the job done. In optimal lighting, the Pixel 3 XL (left) takes trult remarkable pictures, with better color accuracy, background detail, and exposure than either the Pixel 2 XL (center) or Galaxy Note 9 (right). Portrait mode has been improved over the already-great Pixel 2’s implementation, and you now have the ability to change the specific amount of bokeh effect you want, as well as isolate your subject against a black-and-white background. Super Res Zoom, meanwhile, does an admirable job of grabbing detail and quieting the usual noise you get from digital zoom. I didn’t get to test the low-light enhancer Night Sight, as it won’t be available until next month, but it works much in the same way, using AI to stitch together a bunch of images with varying exposures to create one that’s brighter and crisper than a regular shot. The Pixel 3 XL’s Super Res Zoom (left) does a stand-up job, but it can’t complete with the Note 9’s actual optical zoom lens. At this point, however, the Pixel’s camera is basically equal parts arrogance and hubris. No matter how good the Pixel 3’s camera is—and trust me, it’s really good—it would be that much better with optical zoom, a wider aperture, or a second lens. Like EIS on the original Pixel (which was replaced with OIS on the Pixel 2), computational photography can only do so much. 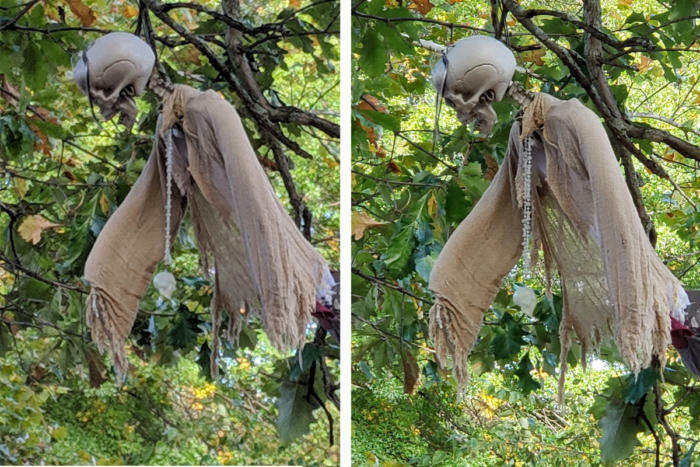 It’s truly impressive what Google can do with a single lens, and the Pixel’s all-AI method results in some truly excellent shots you can’t get on any other phone. Nontheless, I can’t help but wonder how much better the Visual Core would be with a camera system like the one in the Note 9 or LG V40. That wide-angle front camera is about as wide as the main rear camera, and I’ll admit it’s a cool feature: With a swipe along the bottom slider you can dramatically increase the field of view to let more people or more scenery in. Also fun is the Photobooth feature that will snap a pic when the camera sees something photo-worthy on your face, like a smile. The Group Selfie Cam makes a big difference when trying to cram people (and non-people) into a shot. 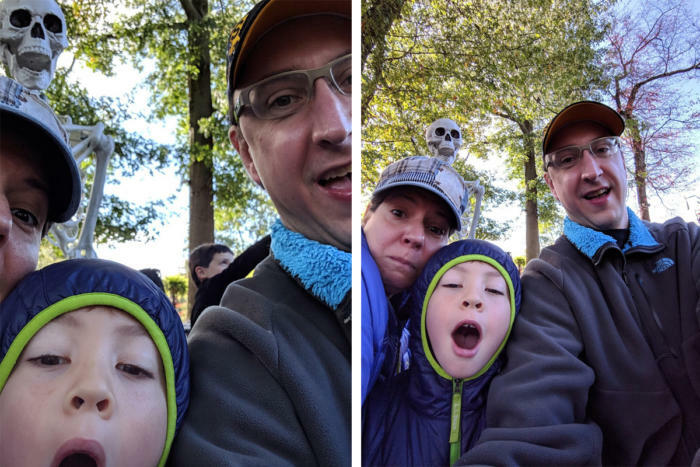 The Pixel 3’s front camera array shows how strong hardware can boost the results of computational photography, but there’s a catch: The second lens on the front doesn’t help with bokeh-effect portraits, like it does on other phones with two front cameras. Portraits have certainly improved on the Pixel 3, but they’re more hit-or-miss compared to Google’s dual-camera peers. Again, it’s incredible to see Google’s AI suss out where the subject ends and the background begins, but leveraging a second lens would surely results in even better shots. Should you buy a Pixel 3 XL? Does hardware design matter more than software? Does camera hardware matter more than image processing? Do the best hardware specs matter more than the latest software? More than ever, that’s the difference between the Pixel 3 and every other Android phone: hardware versus software. There’s the ridiculously good camera. The surprising and delightful AI flourishes. The Android 9 optimization. Out of the box, the Pixel 3 XL doesn’t feel like another great Android phone, it feels like a whole new platform. And as Google commits to bringing new features to old phones, the gulf between the Pixel family and the rest of Android will only grow wider. Yes, it costs more than ever (in the case of the smaller model, nearly 25 percent more), but Google is establishing a new level of premium with the Pixel 3 XL. 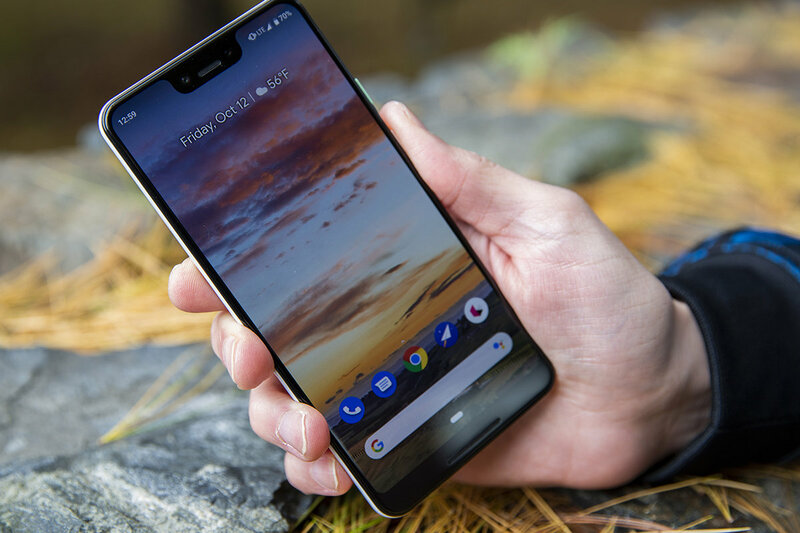 Of course, if you already own a Pixel 2, buying the Pixel 3 may not make much sense, as so many killer features will trickle down to the entire Pixel family. But if you haven't upgraded your phone in more than one or two years, the Pixel 3 has to be considered—especially if you value a locked-down software experience above everything else. And that's the point of the Pixel 3: turning Pixel into a platform. Like the iPhone, Google is putting the user experience ahead of the specs or features enthusiasts crave. It may be a tougher sell—especially at premium prices—but it also comes with a guarantee few other phones can offer: This time next year, it’ll actually be better.